Do you have a friend that would be a great addition to the Charger family? Update your contact information: Please send any changes to your contact information by emailing: snewhouse@dallaschristian.com. If you wish to be deleted from our list, please let us know. Original charter drawn by 15 trustees under the name of White Rock Christian Schools. WRCS opened at the Garland Road Church of Christ building with three faculty members and 65 children enrolled in two kindergarten classes and one first grade class. The first Partnership dinner was held at the Fairmont Hotel. DC graduated its first 12th grade class. The official name of the school was changed to Dallas Christian School. Dr.Vaughn Luster, Jr. was name chief administrator. Additional classroom space was added to the high school. Campus moved to its current Mesquite location. The campus facilities were formerly occupied by a college first known as Christian College of the Southwest and later as the Dallas branch of Abilene Christian University. The Early Childhood Learning Center housing K3 through first grade was built. Cox Event Center, a multipurpose complex serving athletics, music, drama and other event-oriented activities was dedicated. The elementary school was rebuilt from within to undergird its structural safety. Wheeler football field completely renovated and a new four-lane track was constructed. Science and Technology Building completed. Unprecedented campus expansion, including a remodeled junior high building, a remodeled library, a new junior high science lab and a new womenâ&#x20AC;&#x2122;s softball field. New high-school computer lab completed. New high-school cafeteria was built. Early Childhood Learning Center and Elementary school won the Blue Ribbon Award by the U.S. Department of Education. expectation in Mathematics, Reading and Language. Dallas Christian Middle School students average post high school (4+ years) in Reading, Language and Science. These same students consistently achieve two years above grade level in Mathematics. High School students’ ACT composite score of 24 is almost 4 points higher than our local districts and SAT 1083 is well above local scores averaging 954. Although formal testing is a tool to measure the academic progress, preparation for the tests does not dominate the instructional time in a Dallas Christian classroom. Testing is limited to just 3 days in the Lower School and up to 5 days in the Middle School. National average is 39 days. Striving to meet academic goals is not to overshadow the importance of living Christ-centered lives. Therefore, preserving classroom time to ensure students are nurtured in their faith development is vital to the success of accomplishing the mission before us at Dallas Christian. FACULTY SPOTLIGHT Shane Scott Accepts New Position as Dean of Students / Campus Minister Dallas Christian was thrilled to add Shane Scott, DC graduate of 1996, as our new Dean of Students and Campus Minister for the upper school this fall. In this role, he will be working with our upper school administration to provide consistent enforcement of the student handbook and promoting spiritual formation in our students. Shane has led our students in collecting items for the Hurricane Harvey relief in Houston and took a group of high school students to serve with Church of Christ Disaster Relief in south TX. His role also involves organizing chapel and teaching the Bible Leadership class in the high school. Shaneâ&#x20AC;&#x2122;s history with Dallas Christian runs deep. 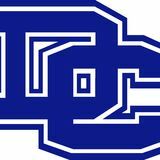 He attended DC from 1992-1996 and has been teaching and coaching at DC since 2002. He previously served as middle school and high school Bible teacher, coaching football, basketball, and track. He and his wife, Mandy, attend New River Church along with their three children Drew, JT, and Landry who are in third grade, first grade, and kindergarten at DC. Accreditation Renewal Process Completed Dallas Christian completed our accreditation visit this fall with the National Christian School Association and AdvanceED. NCSA partners with AdvancED, to offer dual accreditation to participating private schools. The NCSA is recognized by the Office of Non-Public Education in the U.S. Department of Education, the National Center for Educational Statistics and the U.S. Census Bureau. The accreditation process verifies that private schools stress academic excellence in a Christian environment. Every five years private schools go through a process to renew their accreditation. These organizations conduct rigorous, on-site reviews of educational institutions and systems to ensure that all learners realize their full potential. Their goal isnâ&#x20AC;&#x2122;t to certify that educational institutions are good enough. Rather, it is to help institutions continuously improve. 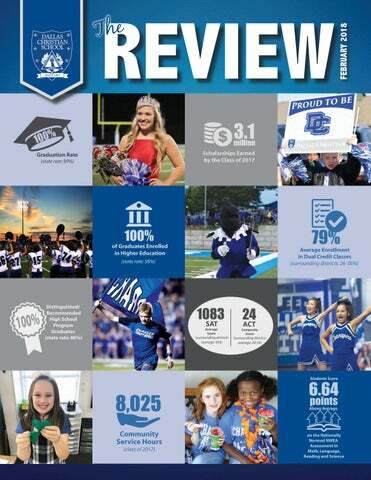 We are proud that Dallas Christian received excellent reviews and completed the process for renewal. HIGH SCHOOL Senior & First Grade Buddies Our 2018 Seniors continued the tradition of â&#x20AC;&#x153;adoptingâ&#x20AC;? first graders this fall. The pairs get together once a month for fun activities and have already developed special bonds. Every summer the incoming Senior Class gets the experience of going on a senior retreat. This year the Senior Retreat was held at Lakeview Camp and Retreat Center in Waxahachie. The purpose of the retreat is for the class to reconnect before the start of school. They held team competitions, devotionals, lots of fun outdoor activities and had guest speakers who talked to them about their senior year and beyond. It was truly a bonding opportunity that created a sense of unity and commitment for a successful senior year. Engineering Class Our Engineer Your World class offering was started this fall in partnership with The University of Texas at Austin. Our students gain knowledge in the engineering design process through project-based learning and daily group work. The students have enjoyed learning about different personality types and how to capitalize on each otherâ&#x20AC;&#x2122;s strengths within their groups. They have been busy designing and building pinhole cameras, developing black and white film, and reverse engineering a flashlight. The class even spent a day interviewing students from the Elementary and ECLC about their opinions on the use of the flashlight. Upcoming projects include units on: Understanding Data - Designing Coffee; Designing with Data - Safer Buildings; Programming - Electronic Music; and Systems Engineering - Aerial imaging. Film Making Class Another new class offering that began this fall is a filmmaking class. Two sections of this class quickly filled up. The class is learning how to use video, lighting, sound and editing. They have already completed several projects that the school has been able to use on our website and social media. Every student in our middle school spent a day this fall serving others. The grade levels served at the following locations: 6th Grade- Life Message in Rowlett; 7th Grade- Our Calling in Dallas; and 8th Grade- Cornerstone in Dallas. Life Message in Rowlett Students sorted food, clothes, and cleaned the floors and grocery carts. 7th grade Our Calling in Dallas Students separated large amounts of clothes into different sizes and genders, then prepared lunch and delivered them to the homeless. Cornerstone in Dallas Cornerstone is a place where among other things the homeless and underprivileged go once a week to receive a hot meal. Our eighth graders helped prep for the food service by picking up trash, wiping tables, cleaning hot food tray holders, and stocking and organizing their food pantry area. Lower School chapel is a great time of worship and community for our younger students. ECLC students meet Monday and Wednesday for worship, Bible study, and application. Elementary students meet Tuesday and Thursday covering the same lessons as the younger students but being able to go a little deeper in study. The second through fifth graders take leadership roles in chapel time and everyone brings their Bible so that we can find the scriptures we’re studying in the word. This year both age groups are following the curriculum “Kids Own Worship” as an outline with the wisdom and direction of our teachers rounding out this wonderful worship and learning time. On Fridays, ECLC and Elementary students combine for a large corporate worship in the Charger gym. It is such a wonderful time of praise! We also enjoy guest speakers from our school community and student led worship from our high school students at times. One aspect of our chapel studies is challenging each other to follow “The Charger Code.” The Charger Code focuses on relationships, actions, character, and honoring God. Each week we honor a class who has met the requirements of the Charger Code and been nominated by teachers in the lower school. Many of our lessons center around these qualities and what they look like in Christ-followers. Chapel time is a priority in the lower school. We want our students to head into middle school knowing God and having the tools to serve Him, particularly through the act of worship. When the twelve Bible leadership students were gathered at the beginning of the year, a question was placed before them: What will the theme of the upper school chapel be this year? The students decided to not focus on one message, but on several of the important messages that spoke not only to their hearts but the hearts of their fellow students as well. The topic of “Showing Truths and Breaking Lies” spearheaded the idea for the beginning of the year, with several students who felt passionate on the subject testifying to the truths of Christianity while simultaneously shining light on the spots that needed to be talked about with their fellow high school peers. The I AM statements finished out the second half of the first semester, with another group of students touched by the topic speaking. From “the salt of the earth” to “being worth more than many sparrows,” students in the high school were given a chance to hear about many aspects that could affect their everyday spiritual life. A group of high school students and teachers went to South Texas this fall on a trip to help our Texas neighbors that were affected by Hurricane Harvey. DC families also collected items needed in the Houston area and those items were loaded up and delivered through Impact Church of Christ in Houston. DC partnered with Ft. Worth Christian this fall and sold bracelets in support of Westbury Christian School in Houston. Many families at Westbury were affected by the hurricane. We were able to send a donation down that went directly to help those families. Bake a Difference Some of our DC students were looking for how they could serve others and started the â&#x20AC;&#x153;Bake a Differenceâ&#x20AC;? Club. These students sold baked goods during lunch periods in order to help others. INTRODUCING THE NEWLY RENOVATED Dallas Christian Schoolâ&#x20AC;&#x2122;s new football field was ready in September for our first home game. Our new field was prayed over and a Bible was placed in the sidewalk before the concrete was poured. The first home game was a huge celebration complete with a ribbon cutting, press box dedication and fireworks after the game. The collaborative sculpture piece above was created by DC art students for Mrs. England, DC’s Upper School Principal. The sculpture is titled “Family.” Mrs. England is represented by the figure with the heart and each student made an image to represent themselves. Congratulations to the DC Drum Line for winning 2nd place overall in the TAPPS competition. NEW 2017 TEAMS Bass Fishing Team This fall Dallas Christian high school started the DCHS Bass Fishing Team. The team is part of Texas High School Bass Association. Teams consist of two anglers on a boat with one boat captain. Our team has done well in their tournaments this fall and will continue competitions in the spring. DC formally launched a wrestling program this year that is open to middle school (7th/8th grade) and high school boys. Troy Mercer was hired to lead the team. Troy is a recent Graduate of Lyon College with a Bachelorâ&#x20AC;&#x2122;s of Science degree in Business Management. Heâ&#x20AC;&#x2122;s also the owner of Apex Grappling Academy based in Heath, TX. Troy is a decorated college and high school wrestler and is still active in competition. Our DC families were excited to reconnect at our annual Back to School Picnic & Pep Rally in August. New families were introduced to DC with hamburgers, shaved ice and an amazing pep rally. Magazine Drive The â&#x20AC;&#x153;More than Magazine Driveâ&#x20AC;? is our main fundraiser each year. The students get very excited about the prizes they can win. The PTO organized a fabulous new event in December called the Jingle Mingle & Holiday Market. Local businesses set up booths for families to do their Christmas shopping and there were fun activities for the children including face painting, cookie decorating and even pictures with Santa. There was a great turnout of DC families and friends in the community. Our annual Grandparentsâ&#x20AC;&#x2122; Day celebration was on November 17th. We had a huge turnout this year and enjoyed performances from our band, choir, and lower school students. Grandparents ended the day with a tour of the classrooms and an art show in the high school. We are thankful that so many of our DC grandparents were able to attend. The PTO Carnival & Renaissance Fair was held November 4th. It was one of our biggest and best carnivals and even included a real jousting show at the end. Our families enjoyed costume contests, inflatables, games, food, and more. Winner & best-selling artist of The Voice. Thank you to our PTO! Our PTO hosts a monthly meeting, providing an opportunity for parents to pray for our students and school. Our dedicated PTO hard at work! GAGA Ball Pit Donation This year our PTO purchased and installed a Gaga ball pit for the Elementary playground. Our students have thoroughly enjoyed using it this year. ALUMNI NEWS Congratulations to Zach Turner, DC Class of 2000, who was featured in the November edition of the Dallas Business Journal. Zach is currently the Chief Executive Officer of Techni-Tool, Inc. based in Dallas. TechniTool uses data and analytics to make manufacturing companies as efficient as possible, helping them reduce their spending on inventory. After Dallas Christian, Zach studied finance at Southern Methodist University and went into banking. But in his late twenties, he made the transition to Techni-Tool, Inc. where he has helped the company grow and expand. Class of 1977 Reunion The Class of 1977 reunited this fall for their 40-year reunion. They donated a park bench to the school in memory of their former classmate, Ramona Miller. It was a great day full of nostalgia and memories as they toured the campus together. Our DC grads are thriving in college!